Mack has been so excited to spend some time with Josh. They have planned for a little guy-time this week, and I cannot begin to tell you how thrilled Mack was about it…it is just beyond words. Anyway, this morning when I walked downstairs I found this on my phone. I mean, seriously. He is absolutely the sweetest. All of my kids have some neat personalities. Ruby is LOYAL and CONSISTENT. Molly is INDEPENDENT and PERSISTENT. Mack is TENDER-HEARTED and THOUGHTFUL. I don’t mean to say that is all that they are, but these are the characteristics that rise to the top at this point in their young lives. 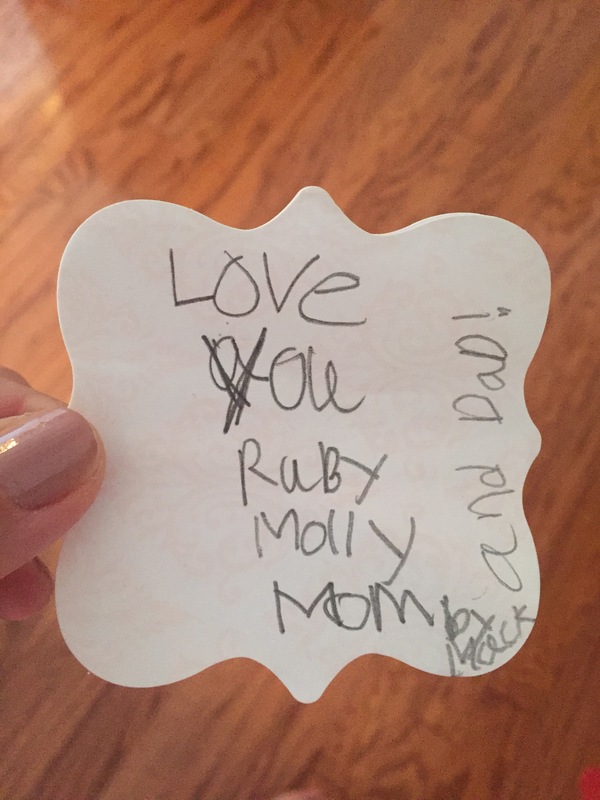 So, back to the love note to us girls from Mack (and Dad). I called Josh to tell Mack thank you for the note, and Josh told me it was ALL Mack…he saw him go in the school room, but then Josh noticed the note as they were walking out the door. I continued to gush over Mack’s thoughtfulness and sweetness and then I said…. I suppose Josh sensed some irritation making its way from my lips..and he said…. In his defense, he does email me and text me encouraging and loving messages; however, this morning most definitely reminded me that a handwritten love note sure does the heart good. So, while I appreciate so much the technological conveniences of these times, I want to pick up a pen and a piece of paper or sticky note and let some people know I love them. How about you? Next Post Guy Time, Girl Time and Growing Up!